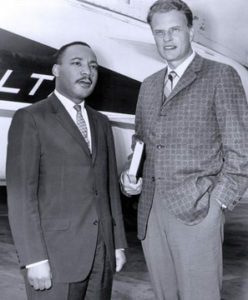 The name Billy Graham is known throughout the world, to believers and non-believers alike. He was recognized as the world’s most influential preacher. Born November 7, 1918—he would have turned 100 this year—William Franklin Graham Jr was a Southern Baptist minister whose ministry became global after 1949, thanks to the annual crusades he began in 1947 and continued until his retirement in 2005. In those 58 years, Graham conducted big indoor and outdoor rallies in over 185 countries and territories on six continents. The longest Graham’s evangelistic crusade took place in Madison Square Garden, New York City, in 1957, which lasted 16 weeks! 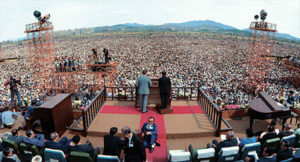 The largest audience—1.1 million people—in the history of Graham’s ministry assembled at Yoido Plaza in Seoul, South Korea in 1973 (pictured). He was the first foreign evangelist allowed to preach in North Korea in 1992. Graham’s crusades became so popular, they were broadcast on radio and television. Some of his sermons are still being broadcast today around the world. As Proverbs 18:16 puts it, a man’s gift makes room for him, and brings him before great men. Graham became greatly influential among world leaders: he served as a spiritual adviser to American presidents and provided spiritual counsel for every president from Harry Truman to Barack Obama. He was invited to preach privately to Queen Elizabeth and her household on several occasions. He met with North Korean leader the late Kim Jong Il, which led to him being able to preach there. 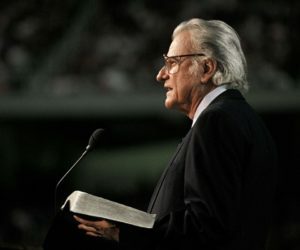 As widespread as his ministry went, Graham’s crusades authentically touched the lives of millions of individuals across the world, many of whom have personal stories of receiving salvation at a Billy Graham crusade.